Fredric Fekkai always makes my hair feel like....like butta. If you've never tried, get you some. If you color your hair, the technician color care makes your hair so shiny, it looks like you just came form the salon daahhhhr-ling! The shea butter deep conditioner makes your hair so glossy and smooth. And the glossing cream always perfectly smooths my semi-frizzy waves, making it an everyday use in the summer! 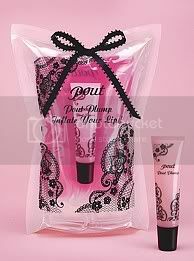 Pout lip plump is super and I have an amazing lip pot gloss that has been a fav of mine in the summer. However, Pout closed their doors at the end of 07, so I am going to have to use what I have left VERY sparingly. Then scour eBay when I use what I have left.